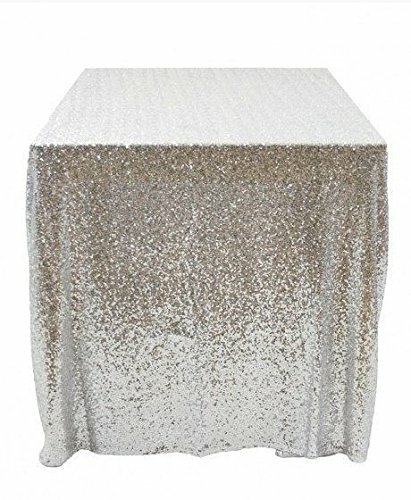 Our 72 inch square satin table overlay in silver is the perfect option when trying to decide how to add beauty and glamour to your wedding venue. 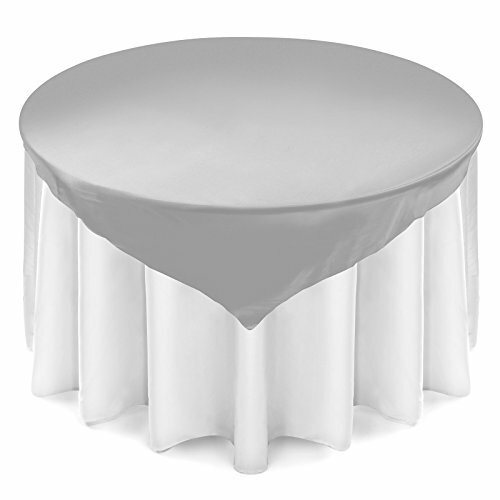 These square satin table overlays are crafted to give you the look and feel of real satin. 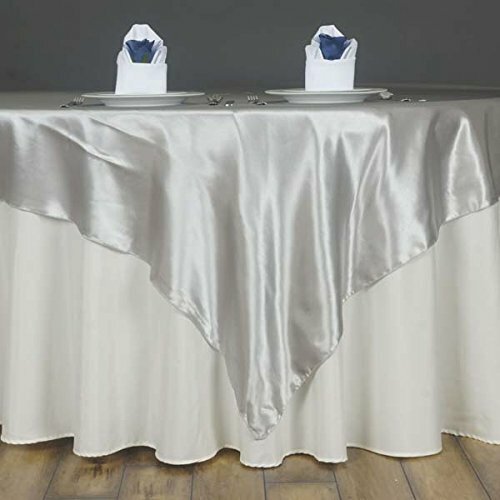 Combine our overlays with our satin table runners and satin chair cover sashes to add unparalleled beauty to your special event or wedding table setting.Photo is for display purposes only. 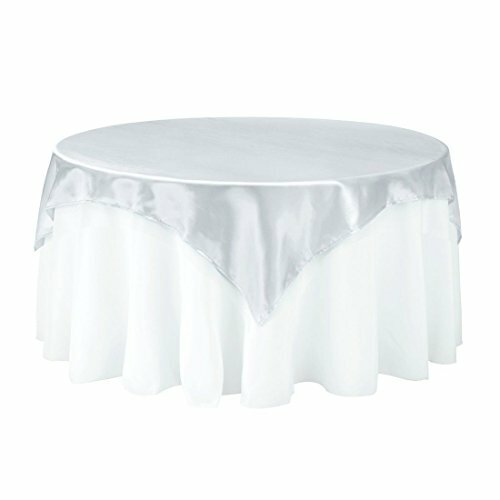 The white tablecloth underneath the table overlay is sold separately. 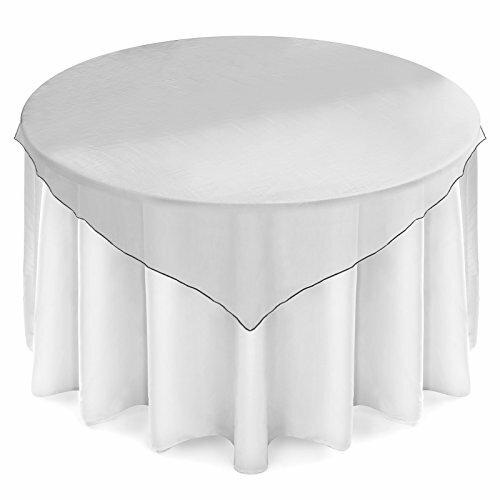 Square satin overlays, when combined with a round tablecloth, will raise a plain tablecloth setting up a notch and create a fine event banquet table linen presentation. 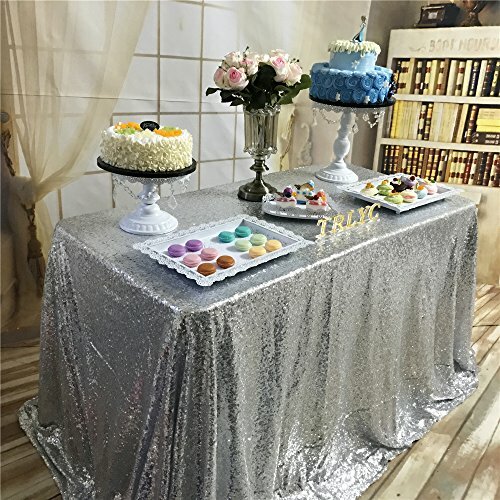 Our 60 inch square silver satin overlay, when used as an added table cover overlay, portrays an air of smooth splendor, and when combined with other wedding table linens such as cloth napkins, placemats or favor bags, the impression is truly spectacular! 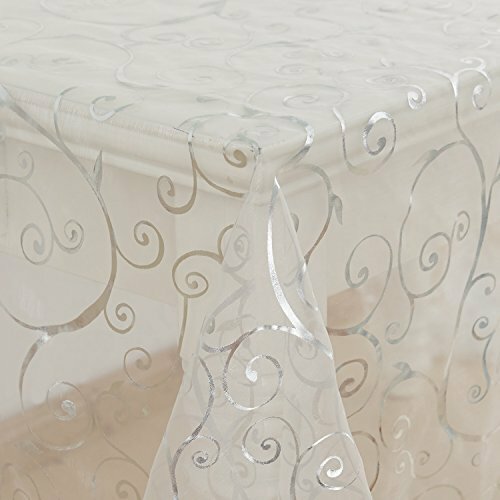 Boasting a seamless one-piece design with a lustrous texture and high-gloss sheen, this premium satin table overlay creates a stunning table arrangement for any formal occasion. Beautiful all by themselves or adorned with the addition of bows and floral arrangements, this first-rate table decoration adds subtle sophistication to any wedding reception, graduation event, anniversary or birthday party, or other special occasion.Finely detailed with serged/overlocked edges to maintain its shape and eliminate fray, along with color-fasted, stain-resistant fabric, this tablecloth overlay ensures a wonderful presentation with every use. To release any wrinkling that may occur during shipping, simply place in dryer on low heat for a few minutes. 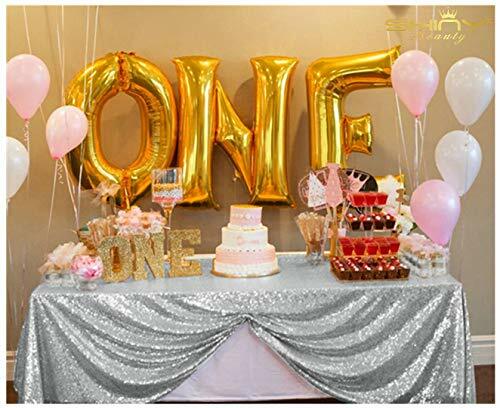 Due to the many variations in monitors and browsers, color samples may appear slightly different than actual product.Well-known within the national hospitality and restaurant industries, private wedding and banquet venues, and the party catering community, Lann's Linens is your trusted source for premium quality products that provide 5-star style at an affordable price. Satin has an unsurpassable sophistication and charismatic appeal about itself, it is undoubtedly, most preferred embellishing fabric that is adored by people all over the world and is tirelessly utilized in designing elegant formal attires, accessories, decorative flowers, ornaments and a lot more. The lustrous glossy texture of the fabric together with the seamless sheen and sublime elegance it exudes make it everyones favorite all around the world. Spread charmingly atop your colorful or plain table covers, these glinting darlings will heighten the urbanity of your events ambiance. Pair it with matching satin table runners and napkins and adorn with the satin rose buds or velvet petals for a more glamorous look. Additional Information: How to Care: Hand wash only. Hang dry, don't use dryer. Material: Satin Approximate Measurements: 60" x 60" Edges are Serged. Looking for more Silver Overlay similar ideas? Try to explore these searches: E-Clip Set, Garden Cap, and Big And Tall Layered T-Shirt. Look at latest related video about Silver Overlay. Shopwizion.com is the smartest way for online shopping: compare prices of leading online shops for best deals around the web. Don't miss TOP Silver Overlay deals, updated daily.